This is not an exhaustive list for any particular time period - just some records that I have come across during my research travels. Above: Ballad from the Bodleian Library (Bod 12856), printed by Elias Keys, and sold by, amongst others, S Mann of Ashburton. 1793 William Waycott, sojourner in the parish, bachelor, and Mary Wilks Honeywell, spinster of the parish, November 10th, 17th, 24th. 1793 Nicholas Berry widower, and Thomzin Layman, both sojourners in the parish. November 24th, December 1st, 8th. 1793 Richard Taylor of the parish, bachelor, and Mary A_irs* sojourner in the parish, spinster, December 1st, 8th, 15th. 1794 William Hoper, bachelor and Phebe Home*, widow, both of the parish, January 7th, 12th, 19th. 1781 William Spiller and Thomasina Foot were married February 11th. Note: both parties sign with a cross. Besides the mark of the groom is written, 'the mark of William Avery'. 1792/93 Marriages. Thomas Tucker, attorney, to Miss Cookesley, both of Ashburton. 1793 William Waycot of Staverton married Mary Wilkes Honeywell on the 22nd December. 1795 Philip Berry married Mary Cranch Bennett on the 11th February. 1795 Matthew White, widower, married Mary Mugridge, widow, on the 25th February. 1795 Richard Tuckerman married Sarah Joyul on the 8th April. 1815 George Jackson of the parish of St. Botolph in the City of London and Amelia Gervis of Ashburton, married on September 7th, by licence. 1815 William Lamble, sojourner, married Mary Dolbeare on October 19th. 1817 At Stoodleigh, Col. John Hilley Symons, of the E.I. C's service, to Ann, eldest daughter of the late John Edmonds Esq. of Ashburton. 1833 John Holmen, chemist and druggist of Plymouth married Miss Matterface on 26th August. 1835 Henry Caunter of Ashburton married Sarah Fulford of Crediton on 15th October. 1836 Assistant Surgeon William Leggett, horse artillery, married Susan, daughter of the late John Higgins of Ashburton, Devon, at Bombay, India, on 8th June. 1836 John Saunders of Ashburton, carver and gilder, married Miss Tarr of Moretonhampstead on 15th November. 1837 Henry Gervis of Ashburton, surgeon, married Marianne, eldest daughter of William Edgcombe of Penryn, on 23rd May. 1837 J. P. P. Phillips of Gitcombe near Totnes, married Mary, eldest daughter of James Woodley of Halshanger, on 12th June. 1856 William M. Christian to Mary Ann, daughter of George Ireland of Ashburton, Devon. 1860 September 27th William Foot of Arfleet, Rolstone, Dorset, to Susan, only daughter of W R Whiteway, of Kingsbridge-House, Ashburton. 1860 June 7th The Rev. James Law Challis, Rector of Papworth Everard, Cambridgeshire, son of the Rev. James Challis, Plumian Professor of Astronomy in the University of Cambridge, to Margaret Edmonds, daughter of the Rev. William Marsh, vicar of Ashburton. 1860 Marcus (?) Irvin, son of William Irvin, married Elizabeth, youngest daughter of Solomon Northway, of Ashburton, Devon, on July 12th. 1870 William Willcocks, the son of John Willcocks, married Susan Brock, the daughter of James Brock, on March 16th at the parish church. 1871 Wm. I. Bawden, son of the late Isaac Bawden of Ashburton, Devon, married Margaret Ellen Creedon on 11th February at St. Patrick's, Melbourne. She was the daughter of the late Edward Creedon of Toureen, County Cork. 1876 Peter Dunstan Page, son of H. B. Page of Ashburton, Devon, married Annie Elizabeth Allmey on June 17th at All Saints' Cathedral, Bathurst. 1885 Henry Bradridge Tucker, of the Bridge Hotel, Waltahuna, married Carrie Langler on January 8th at Holy Trinity Church, Lawrence. Carrie was the daughter of Mr. G. Langler of Ashburton, Devon. 1888 George Septimus Firth, youngest son of Frederic Hand Firth of Cator Court, Ashburton, Devon, married Annie Elizabeth, daughter of William Mason, by special licence. The marriage took place on January 18th at St. Joseph's, Woollahra. 1905 Mr H S Steele married Miss Wright of Paignton at Banff, Canada. He had previously been a captain of the Haytor Volunteers whilst living at Ashburton, and had served in the Boer War. Above: Wedding photograph of unidentified couple by Miss Satterly, photographer, Ashburton. Assuming that Amy Satterly used her married name after 1909, this would be before that date. 1914 Corporal Thomas Bovey, 20th Batt. A.I.E.F., married Miss Gertrude Bessie Smerdon in November, at Narrogin, Western Australia. Thomas was the son of William Bovey, of Blackmoor, Ashburton, and Miss Smerdon was also from Ashburton - she had only just arrived in Australia. Corporal Bovey rejoined his regiment immediately after the wedding. The couple celebrated their silver wedding in 1939, at which point they were living in Albany. Gertrude's parents were named as Elijah and Bessie Smerdon, and Thomas's late mother as Mary Elizabeth. 1922 James Byers Hay married Bessie, widow of the late S. Mann, on November 11th. She was the youngest daughter of Mr. and Mrs. William Abraham of Ashburton, Devon. 1925 Mary Louisa Flavell, widow of the Rev. Thomas Flavell, died at the home of her daughter in Ashburton, Devon, on May 17th. 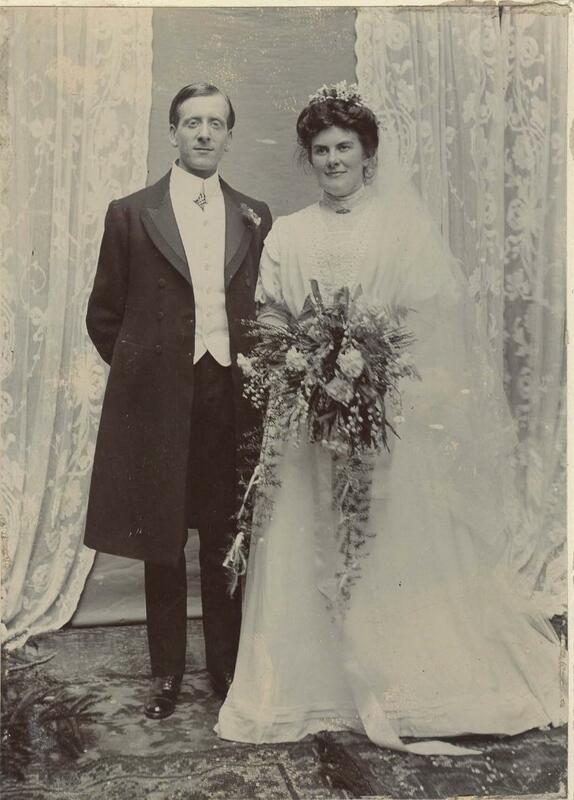 1926 John Alfred Pym of Berkshire married Joyce Rose Godden on March 15th at St. Aidan's. Auckland. Miss Godden was the daughter of Mr. and Mrs. John Godden of Ashburton, Devon. 1933 Gilbert James Palmer, son of the late Mr. and Mrs. Palmer of Ashburton, Devon, married Mary Bridget Ruddy on January 14th, at St. Columba's Church, Charters Towers. Their future home was to be in Ayr.